The Best BIM blogs from thousands of top BIM blogs in our index using search and social metrics. Data will be refreshed once a week. BIM newsletter is a comprehensive summary of the day's most important blog posts and news articles from the best BIM websites on the web, and delivered to your email inbox each morning. To subscribe, simply provide us with your email address. London, England About Blog Building Information Modelling (BIM) technology for Architecture, Engineering and Construction. Facebook fans 700. Twitter followers 3,252. UK About Blog The latest BIM News from BIM Today featuring updates,software, implementation and everything BIM. Planning & Building Control Today is the leading online news portal focusing on Construction, Planning, Development, BIM and Building Control News. Facebook fans 79. Twitter followers 2,586. Sweden About Blog The BIMobject® provide free BIM objects for Architects, Designers and Specifiers - no matter what CAD system they are using - like Revit, ArchiCAD, SketchUp, Vectorworks and AutoCAD. Facebook fans 12,158. Twitter followers 3,327. San Francisco, CA About Blog A place to discuss all things BIM. Facebook fans 1,095,057. Twitter followers 477,561. About Blog Autodesk Revit is a software for BIM (Building Information Modeling). This is your source for information on the direction of software development, insider tips and tricks, and industry trends that can help you get most from the software and work better with cloud-connected BIM. Facebook fans 312,762. Twitter followers 74,485. Facebook fans 42,991. Twitter followers 1,276. Budapest About Blog ARCHICAD is an architectural BIM / CAD software for Mac and Windows developed by GRAPHISOFT. ARCHICAD is recognized as the first CAD product on a personal computer able to create both 2D and 3D drawings. In its debut in 1987 ARCHICAD also became the first implementation of BIM under GRAPHISOFT's Virtual Building concept. Facebook fans 265,941. Twitter followers 17,957. Mountain View, CA About Blog Comprehensive up-to-date coverage for bim, aggregated from news sources all over the world by Google News. Facebook fans n/a. Twitter followers 213,016. Ireland About Blog BIMIreland.ie is Ireland's only dedicated Building Information Modelling exclsuive resource. Daily news & information on the local & international BIM sector. Facebook fans 75. Twitter followers 1,491. Belgium About Blog APROPLAN is a free service designed to make work easier for all building project stakeholders, from the first drawing to the project handover. We are always on the look-out for people whose aim is to help us make life easier for people in the building industry. Facebook fans 826. Twitter followers 2,230. India About Blog Tesla Outsourcing Services offers high end 3D BIM, Revit MEP services for building construction. We offer Point cloud BIM, Construction drawing services to USA, UK, Europe, Canada & Australia. Facebook fans 690. Twitter followers 192. Toronto About Blog The Canada BIM Council serves as Canada's business voice for the entire construction industry, education community and owners who are working collectively with Building Information Modeling (BIM) technologies and practices. Facebook fans 1,088. Twitter followers 2,458. Boulder, CO About Blog EvolveLAB is about making a difference in the industry by innovating the process of designing, constructing, and operating better buildings through technology and building information management. The thing that sets us apart from our competition is that we are a full-service BIM consulting firm. Facebook fans 392. Twitter followers 1,050. About Blog This is a blog about building information technologies. More specifically, BIM. And ways to apply BIM better in architecture, engineering and construction. My name’s Donatas. I’ve been working with building information technologies for more than 20 years: as a CAD and BIM consultant and as the CEO of AGACAD – a developer of productivity software for users of Autodesk Revit. Calgary, Alberta, Canada About Blog BIM convert in Cowtown since 2008, Blogger since 2014, Podcast co-host since 2017 on The Simply Complex Podcast hosted by Marcello Sgambelluri. Senior Applications Expert with IMAGINiT. Facebook fans 130. Twitter followers 1,095. Vancouver, BC About Blog A leading provider of Building Information Modeling (BIM) consulting services and software, we are committed to improving the way that buildings are designed, built, and operated. Summit’s team of industry experts has a passion for technologies - Revit, BIM, IPD - that improve the way buildings are designed, built and operated. Facebook fans 51. Twitter followers 1,230. Facebook fans 2,435. Twitter followers 594. About Blog BIMEET is a new European project combining 9 partners around BIM technology as a key digital support for the energy efficiency of the built environment. Facebook fans 12. Twitter followers 133. Cardiff, Wales About Blog I am doing so to document my experience in applying the Building Information Modelling (BIM) and Smart Building processes to my own home. This is my first attempt at writing a blog, so please be gentle; any constructive criticisms are welcome. Blog by Dan Rossiter. Facebook fans n/a. Twitter followers 1,698. About Blog Revit Pure is learning made simple. We give you the tools to master Revit in the most natural and straightforward way. Facebook fans 267. Twitter followers 42. About Blog Amtech is the UK market leading manufacturer of specialist software for the building services industry. Their range of software is designed specifically for the needs of Building Service Engineers and Contractors and includes the most well known brands in the industry, including: Amtech, Luckins, Estimation & ArtrA. Facebook fans 334. Twitter followers 2,331. Paris About Blog BIM 42 provides the Answer to the Great Question of BIM, the Universe and Everything. Facebook fans n/a. Twitter followers 1,166. Newcastle upon Tyne, UK About Blog BIMcrunch is the leading resource for all BIM (Building Information Modelling) news, views and opinions from the top thinkers in BIM. Your daily BIM feed. Worldwide BIM news and views with audio and video. Facebook fans 145. Twitter followers 6,673. About Blog Our team at Viasys VDC is dedicated to help you increase the efficiency of your civil engineering projects. We can offer you easy-to-adopt solutions based on our own software and extensive knowledge about civil engineering modeling. Russia About Blog My name is Konstantin Zhukoven, and this is my blog about innovative technologies that we use on a daily basis to boost our productivity. Acting as BIM Manager with structural engineering in the background, I am keen on cutting edge technology. I believe that sharing and open source phylosophy would drive our AEC industry forward. Kalamaria, Thessaloniki, Greece About Blog Break with an architect is a blog dedicated to BIM methodology and technology of design applications. This blog aims to inform and inspire through articles related to Building Information Modeling processes and implementation. Facebook fans 5,362. Twitter followers 92. About Blog Women in BIM was set up in 2013 as a networking group to support and draw attention to the low number of women in BIM related roles in architecture, engineering and construction (AEC) and tech generally. Founder Rebecca de Cicco recognised that in BIM and digital construction, even fewer women are visible, and particularly being retained in more senior roles. Facebook fans n/a. Twitter followers 2,838. Cape Town, South Africa About Blog The BIM Institute serves as Africa’s business voice for the education community and owners who are working collectively with all information technologies in a construction management environment. Facebook fans n/a. Twitter followers 1,086. Dallas, TX About Blog HIngePoint provides BIM consulting & systems integration services for the AEC industry. They reinvent how companies do work so they can work on what matters. HingePoint's blog provides the latest trends, tips and best practices for Building Information Modeling (BIM). Facebook fans 152. Twitter followers 1,051. Billingshurst & Newark, UK About Blog We’ve been working hard over the past couple of months to put together four new training courses, designed specifically to help you get started – or reacquainted – with your software, and achieve maximum impact for your business. Facebook fans n/a. Twitter followers 567. Facebook fans 135. Twitter followers 260. Darlington, UK About Blog BIM Strategy is able to provide strategic advice to companies at all levels of the BIM implementation process from how to get started in BIM to the development of a long term BIM deployment strategy. Facebook fans n/a. Twitter followers 1,470. Ottawa, ON, Canada About Blog Trailloop is pioneering building design & engineering workflows to Integrate BIM with Energy Modeling while creating awesome learning experiences through online education. Learn how to use BIM for Energy Modeling to save time, deliver results faster and manage design updates by leveraging BIM for energy modeling. Facebook fans 122. Twitter followers 387. About Blog I am a manager of construction information, tools and people . I believe that hands-on manipulating of project information by all project participants is the key to achieving any meaningful improvement of the AEC industry operating within the post-gambling-era. I consider myself to be a model-based construction information practitioner ( ‘BIM- meddler’) rather than an ‘expert’ o ‘specialist’. Facebook fans n/a. Twitter followers 101. Europe, Asia About Blog Our team of BIM engineers and architects create your BIM model 3D and 4D in Architecture, MEP and Structure as well as BIM objects. Facebook fans 24. Twitter followers 161. 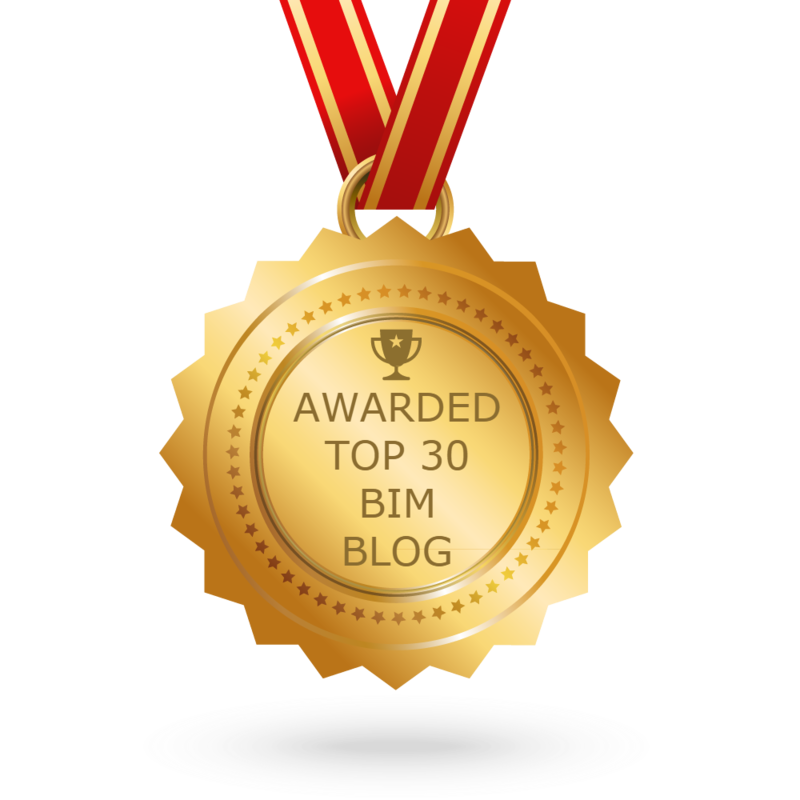 CONGRATULATIONS to every blogger that has made this Top BIM Blogs list! This is the most comprehensive list of best BIM blogs on the internet and I’m honoured to have you as part of this! I personally give you a high-five and want to thank you for your contribution to this world.